The Santa Ornaments Sail Away class is full! The Keeper of the Light Sail Away class is full! The 2019 Sail Away brochure and registration forms are now available here. The February and March 2019 newsletters are now available under News & Forms!!! 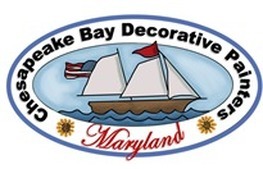 The Chesapeake Bay Decorative Painters (CBDP) is a chapter of the Society of Decorative Painters. We have many very talented people in our chapter, many teachers and some Certified Decorative Artists (CDA's). All members of CBDP must also be a member of the Society of Decorative Painters. Our chapter generally meets the second Saturday of each month (with some exceptions) at various libraries in the Anne Arundel County Area of Maryland between September and June. We have a business meeting and then have a painting workshop. We invite you to check out our website and if you live in the general area and would like to be a part of our chapter, please contact us. Our Chapter also sponsors a 4-day get away/painting conference in Ocean City, Maryland in March each year. We have a "Make-It, Take-It" the first night, painting workshops on Friday, Saturday & Sunday at various painting skill levels, and a banquet. If you are a painter and would like to join us, please check out the Sail Away update page on our website. New information will be posted as available from the Sail Away co-Chairs.